So how does it work? LaundryPure incorporates the power of our revolutionary, exclusive ActivePure Technology with the cleaning action of activated oxygen to lift dirt and grime away from the fibers of fabric and prevent the growth of odor–causing bacteria. It easily installs on either front load or top load residential washers. 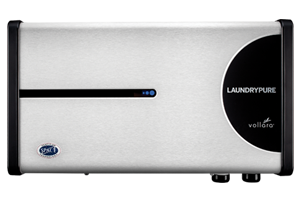 LaundryPure is an amazingly effective cold water laundry system for residential use. Eliminates the need for detergent* – Oxygen, peroxides, and other gases bubble into clothing to lift dirt and odors. An all–natural pretreater may be used for tough stains. Prevent odor–causing bacteria without bleach – LaundryPure combines the power of our revolutionary, exclusive ActivePure Technology, Certified Space Technology, with the cleaning action of activated oxygen to lift dirt and grime away from the fibers of fabric and prevent the growth of odor–causing bacteria. Help eliminate allergic reactions due to detergent residue – LaundryPure also helps eliminate the itching and redness caused by allergies due to detergents embedded in clothing. Get towels softer and fluffier and help clothes last longer – Build–up on towels, linens, and your clothes can weigh them down. Over time, LaundryPure lifts old detergents out of fibers, restoring their natural softness. Make whites whiter and colors brighter – LaundryPure keeps clothes looking their best with the cleansing power of oxygen. Friendly to people, the planet and your pocketbook – LaundryPure eliminates the need for hot water cycles. The unit itself is RoHS compliant and uses 98% less energy than previous models. This means less energy, less pollution, and more money in your pocketbook. Maintenance Free – LaundryPure requires no maintenance.